Climb Paris’s Eiffel Tower, explore Cairo’s ancient pyramids, wander the busy streets of New Delhi and see the lights of Shanghai in this whirlwind tour of the world’s most beautiful cities. 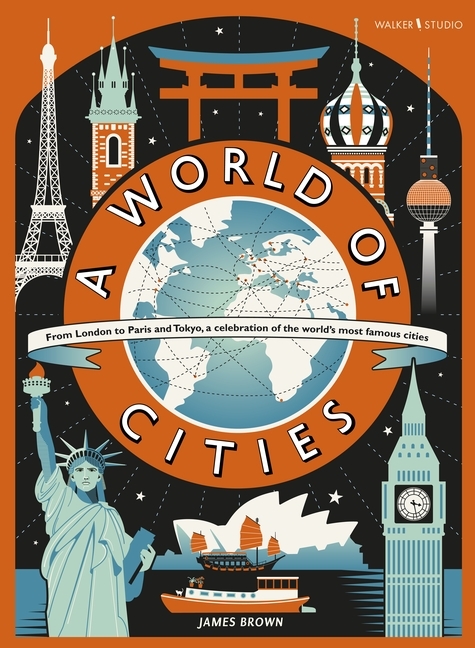 Print-maker James Brown, the talent behind international bestseller A World of Information, has rendered each city in bold, bright colours, with fascinating facts about the history and culture incorporated into the contemporary designs. London, New York and Tokyo have never looked so stylish – or so alive. Lily Murray is a freelance writer who has been writing and editing children’s books for over 15 years. She studied English Literature at university and now lives in a cottage on the edge of some woods with two children, a heroic dog and a strange assortment of other animals. She enjoys walking, reading and trips to London on the slightest excuse. James Brown is an illustrator and printmaker. Trained as a designer, he worked in textiles for ten years before branching out into illustration – his previous project include work for the V&A and the Guardian. His first book for Walker was A World of Information (9781406370843), a beautifully produced miscellany of general knowledge with stunning illustrations from James and words by award-winning non-fiction author Richard Platt. James lives in London, E10. Follow him on Twitter under the handle @jamesprints, or visit his website: www.jamesbrown.info.